Hi. My name is Nicholas Hamblet (that's me on the right), and I'm a systems engineer at Commonwealth Computer Research, Inc., having happily moved on from being a mathematics graduate student at the University of Virginia. I like programming, but also enjoy reading (which mostly ends up being about programming and such). I've also gone through spurts of productivity in origami, particularly the modular sort. 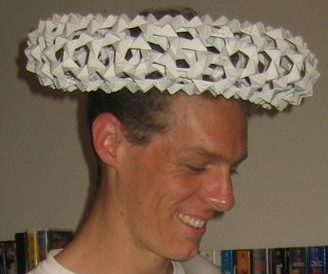 The torus I'm wearing in the picture above was made using Thomas Hull's Phizz units, and this schema.